There are two areas in virtual networking where bottlenecks can slow performance to a crawl. 6WIND’s software innovation leads the market to address these. The first is the hypervisor, which is the virtualization layer, or foundation, which includes key enabling technologies such as the virtual switch. As the foundation for NFV Infrastructure, the hypervisor has taken on many tasks previously done in specialized hardware such as routing, switching, security and multi-tenancy. The hypervisor also has to support the performance requirements of 10, 40 and 100G interfaces. These are tremendous burdens for hypervisors that require horsepower. The second potential bottlenecks are within the virtual applications or VMs themselves. Linux drivers for NICs and virtual NICs were not designed with performance as a priority and thus, cannot scale. Similarly legacy software doesn’t scale on COTS servers. 6WIND’s software helps OEMs and Network Builders transition to NFV solutions with incremental upgrade options that don’t impact existing infrastructure. 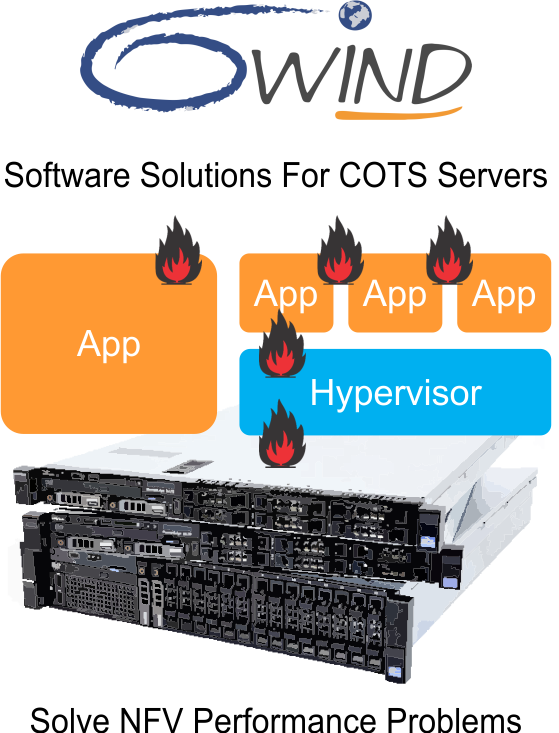 6WIND Virtual Accelerator: Reduces compute resources to maximize VM density and performance with non-intrusive virtual switch acceleration and network infrastructure features including multi-tenancy, routing and firewall. Eliminates SR-IOV and PCI Passthrough to preserve virtualization. Nuage Networks integrates 6WIND Virtual Accelerator within its aVRS platform for accelerated NFV performance. Kontron integrates 6WIND Virtual Accelerator within its SYMKLOUD NFV platform. Telcos Transform and grow your business through cost-effective scaling with platform and network technology powered by 6WIND technology. Telecom Equipment Manufacturers Innovate faster by creating new services for telcos with new uses of software on generic platforms powered by 6WIND technology. Platform Vendors Create value by offering 6WIND-based open, best of breed NFV solutions to telcos and telecom equipment vendors. Integrators Build innovative NFV pre-integrated solutions based on 6WIND technology for telcos and telecom equipment vendors.